You’ve invested a lot of time, effort and money into your show livestock to make sure they excel to their maximum potential. Ensuring they stay healthy and keep performing until they reach their endpoint is always a top priority. To maintain their health and performance make sure you are providing them with the best nutrition possible. EVERY. DAY. Just like a human that takes his or her daily vitamins and supplements to stay healthy, your livestock need the same daily care. 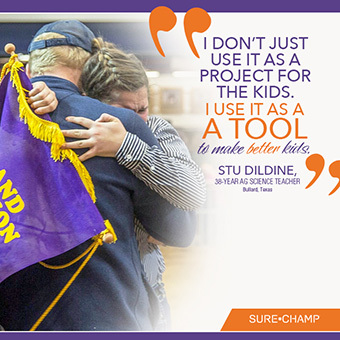 That’s why a product from the Sure Champ® line needs a place in your feed room. Sure Champ products proactively work to assist with the challenges created by the show environment. Sure Champ uses only the highest quality components and proprietary ingredients proven to generate high-yielding results. All Sure Champ products contain Amaferm® a precision-based prebiotic designed to enhance digestibility by amplifying nutrient supply for maximum performance. It is research-proven to increase water and feed intake. In addition to Amaferm, Sure Champ Cattle is fortified with a complete line of vitamins, minerals, and trace minerals. 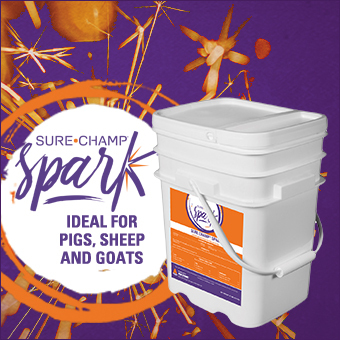 Products like Sure Champ Spark® and Sure Champ Extreme with Climate Control do not contain additional fortification, so they can be fed across a variety of feeding programs and to sheep, goats and pigs in addition to cattle. The Amaferm advantage improves daily intake, digestion and absorption. Show animals go through a lot of stress, and that stress has a significant impact on their immunity and consequently their digestive health. Although you have equipped your animals with a quality nutrition program, sometimes stress challenges do happen. When your animal does have a bad day or experiences stress, it is nice to know there is a product ready to help that actually complements Sure Champ. Vita Charge® is an immediate-response product designed for all livestock species to help provide an extra boost when the immune system or digestive tract has been compromised due to stress. Since the microbial population is one of the first things to be negatively impacted in the animal’s gut when it is stressed, increasing the level of Amaferm, through the addition of Vita Charge, helps maintain that microbial population. Since Vita Charge is intended as a quick response product, rather than for daily use, Blaine Rodgers, Show Livestock Business Development & Field Support, suggests using Vita Charge products as a proactive measure anytime you know you are changing any part of your animal’s routine or treating a sick animal. “Antibiotics will reduce the microbial population in the stomach, so any time you treat a sick animal, I’d suggest giving Vita Charge. Also, anytime you change feeds, deworm or do anything that is out of norm from your daily routine, use Vita Charge as a preventative,” Rodgers said. “Vita Charge is not designed as a daily supplement because it doesn’t have all the macros an animal needs on a daily basis, but it does have the elevated levels of vitamins and trace minerals to combat stress. When an animal stresses the first thing that is compromised is its immunity, so we want to prevent problems before they start or give them a boost to cope with that stress,” she said. For Sure Champ users that depend on either Sure Champ Cattle, Sure Champ Spark or Sure Champ Extreme for daily use, there are a variety of Vita Charge products to use and methods of administering them. The most commonly used products are Vita Charge Liquid Boost®, Vita Charge Paste and Vita Charge Stress Tubs. Liquid Boost and the Paste can both be used across all species and are easily portable in a show box. It is recommended to start them on animals three days before hauling them to a show and while at a show to help eliminate stress and keep them on feed and water. The Liquid Boost can be directly added to water and helps mask the treated flavor and scent of most town water that animals are not typically accustomed to. The Stress Tubs are specifically formulated for cattle. The 50-pound size can be taken to shows to help eliminate stress or simply used at home during times of stress. “One of the best things about the Vita Charge products is they are not a probiotic or don’t contain living organisms, so the products travel well. They have a long shelf life if you keep them in a show box,” Rodgers said. Daily management and nutrition are keys to keeping your livestock on the right track. But everyone and every animal has a bad day once in a while. Isn’t it nice to know there is a complementary supplement that helps reduce stress and strengthen the microbial population to keep your animal reach its potential? Sure Champ and Vita Charge make a winning duo and keep your animals on the right track.